NEW YORK CITY, March 5, 2015 The two-day New York City Bike Expo is sold out of vendor space within a month of opening sales. The expo draws 10,000 cycling enthusiasts on the occasion of Campagnolo Gran Fondo New York, the 100-mile bike race held on May 17, 2015. NYC Bike Expo is the mandatory in-person race packet pickup location for all 5,000 Campagnolo GFNY participants. An additional 5000+ non-participants visit the expo to check out the latest cycling gear, stock up on cycling products available for purchase and be surrounded by like-minded, passionate cyclists from over 70 countries. Among the visitors are members of hundreds of cycling teams and clubs. 75% of the expo’s visitors are from the US and 25% are from abroad, including countries like Canada, Mexico, Italy, Sweden, Brazil, UK, Germany, Colombia, Japan and more.The cyclists in attendance are dedicated athletes who ride their bike year-round covering thousands of miles annually. They are mostly men in their 30s and 40s, highly educated and 90% earn over $75,000/year. NYC Bike Expo allows direct interaction with this appealing demographic. “NYC Bike Expo is the best consumer expo we ever attended,” said Dan Large from Campagnolo. The 2015 show will be held in Penn Pavilion on 7th Avenue at 33rd Street on Friday, May 15 from 11am to 8pm and Saturday, May 16 from 11am to 6pm. New for 2015, NYC Bike Expo will hold the GFNY Lounge where visitors will be able to sit back and relax, hang out together, talk cycling and have a feeling of camaraderie and enjoyment around likeminded people. The GFNY Lounge will be on the ground floor of the expo and feature sampling of beer, wine and coffee by various vendors. Campagnolo, Elite, De Rosa, Limar, Paragon Sports, T Edward Wines and The Stick are among the companies that exhibited at New York City Bike Expo in 2014 and are coming back this year. New companies exhibiting at the expo are, amongst others, Orbea, Time, Corima, Endura and eoGEAR. 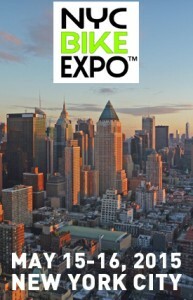 For a full list of exhibitors and to register to attend the expo, please visit nycbikeexpo.com. The New York City Bike Expo is a consumer show focusing on road cycling. The fifth annual expo takes place May 15-16, 2015 at Penn Pavilion on 7th Avenue at 33rd Street. NYC Bike Expo will host 44 vendors and 10,000 visitors from around the world. The official NYC Bike Expo website is: nycbikeexpo.com . New for the 2014-2015 season, GFNY WORLD features events in Italy, Mexico, Puerto Rico, Colombia, Spain and France. Campagnolo Gran Fondo New York raises funds for Operation Smile, the international children’s medical charity. The official Gran Fondo New York website is: granfondony.com.